Like any right-thinking boy, B.T. thinks robots are pretty cool. Unfortunately, as young as he is, he doesn’t yet understand that the robots are poised soon to revolt and overthrow the dominion of man, becoming our new and implacable overlords. 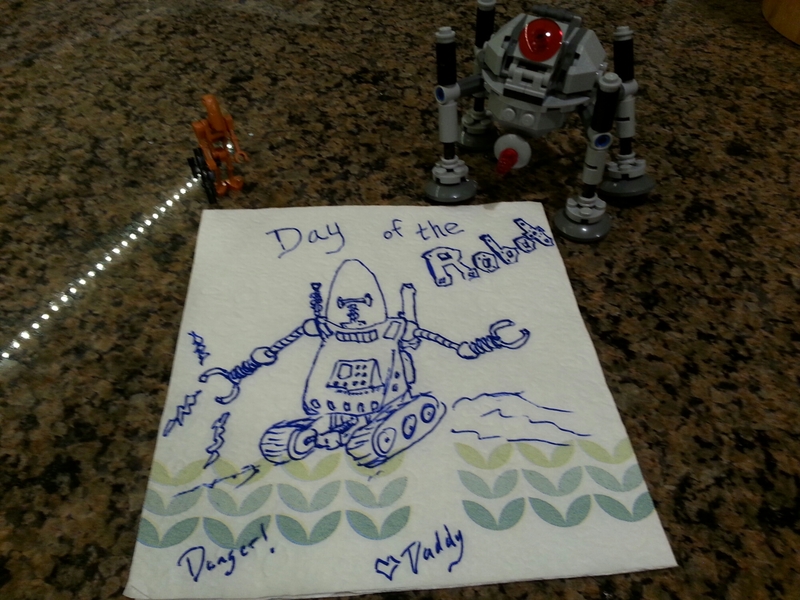 But, hey, until the coming day of the bloody robot coup, robots are still pretty cool! This vintage-inspired robot (with design elements cribbed from Robby the Robot, B-9 from Lost in Space, and Johnny-5) comes flanked by some Star Wars Lego robots that B.T. built yesterday. B.T. has yet to see any of the Star Wars movies – I’m waiting until he’s just the right age to fully appreciate them – but even without having seen them he intrinsically understands that Star Wars sits at a rare pinnacle of awesome. I just can’t wait until he finds out that Darth Vader is Luke’s father. So, anyway, yeah… Robots! Or Droids, if you prefer. B.T. has a lot of favorite books among which one ought to count “Way Down Deep in the Deep Blue Sea”, in which a young boy dives deep into the ocean and interacts with various sea creatures as he swims to the bottom where he retrieves some sunken pirate treasure for his mommy before being chased to the surface by a shark. The twist: he was taking a bath the whole time, using his imagination, and the sea creatures were his bath toys. It’s a fun kids’ book. More recently he’s gotten into a game on his new mini tablet, as well as a related show, featuring cartoonified mer-kids and a merdog called Bubble Puppy (the dog’s name, not the show; I don’t know what the show is called). So, I thought an undersea theme featuring some merpeople might go over well with him. Maybe it’ll go over well with you guys, too. No particular reason. Just a griffin. Or a griffon. Or a gryphon. Or, you know, whatever. Not exactly my best mythical creature, but see my earlier comment about drawing in ink. 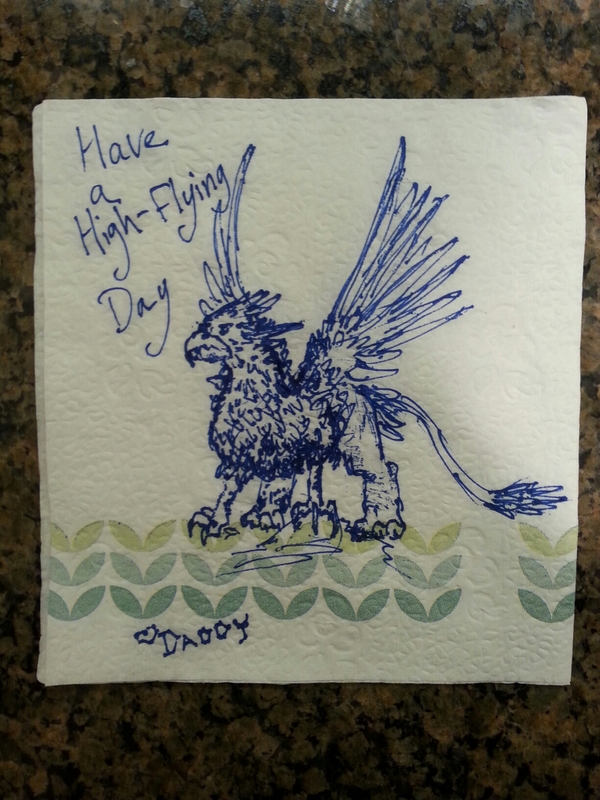 So Dear Wife and I trade off on drawing little doodles on a napkin that goes in BT’s lunch box. Did I mention yet that BT is in kindergarten this year? No? Well, BT is in kindergarten this year. He takes a lunch box every day. We give him a napkin to go with. 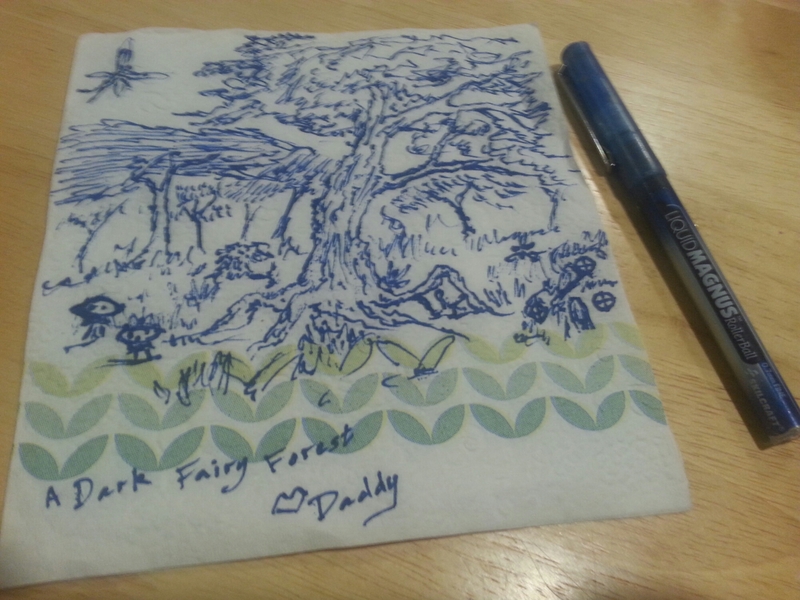 Dear Wife started doing doodles and art on said napkin. I later joined in the fun. And here we are. 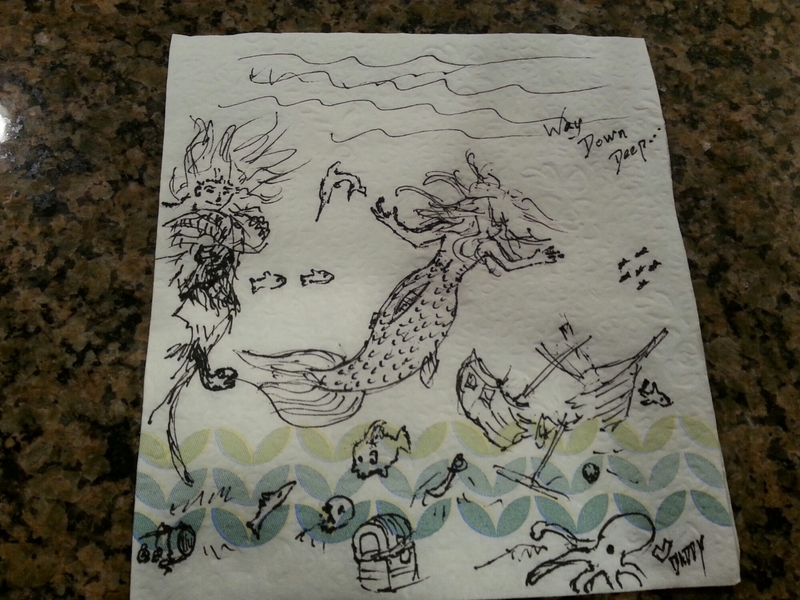 This is not my first napkin rodeo. 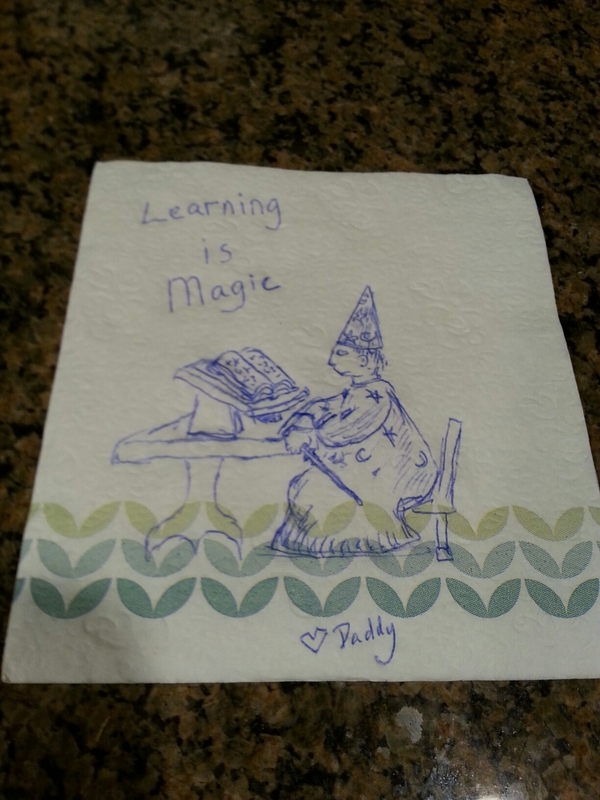 Some of mine have been pretty good (for a five minute doodle on a napkin by a guy who hasn’t done art seriously or consistently for years), and Dear Wife had convinced your humble host that they are blog-worthy. This is not my best work, but it’s the first after I decided to take her up on the idea. 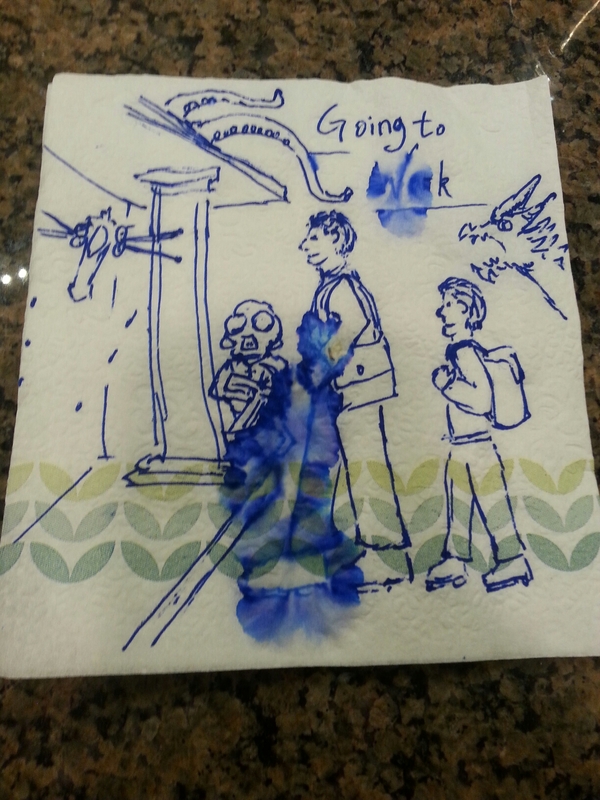 Most napkins I post here won’t have so much commentary. I just wanted to provide some context for this little side trip. BT is doing camp this week since regular school is still out for “winter” holidays. (Scare quotes because global warming is telling us it’s already spring here. We’ve literally had to turn on the A.C. to stay comfortable. Years we’re cranking the heat.) 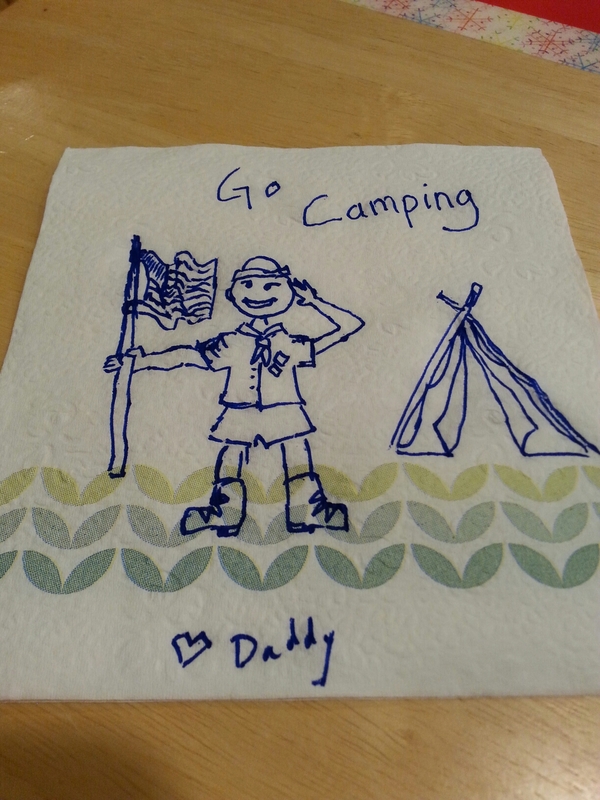 So, my doodle is of a young scout at camp. I intentionally made the head extra-round for mostly unsuccessful stylistic reasons.